Watch the drone video of the Lakeside Speedway flooding below. The river hit crest at 35 feet on Saturday. The high waters is what caused the levee to break in the first place. Three of seven buildings at the track were put underwater. Due to the flooding, the season opener has now been postponed. “Well, mother nature has decided that she wants to postpone our race season. Yes we have flooded. 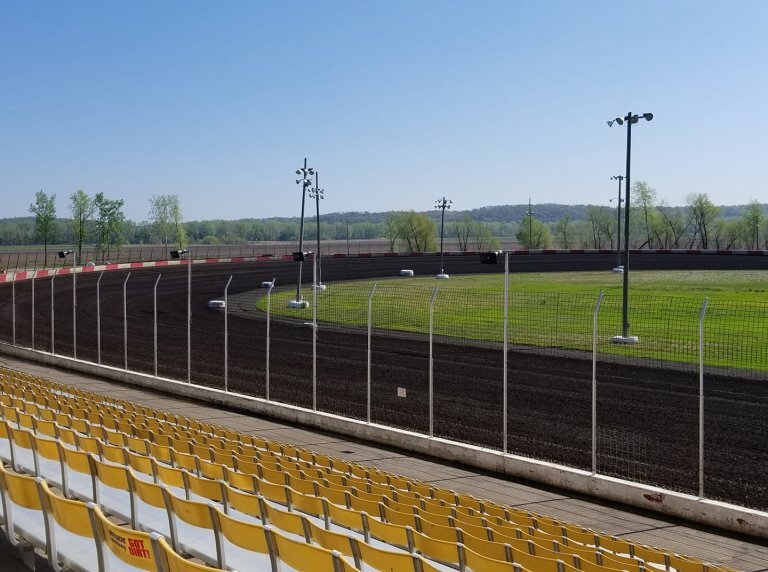 A levy north of the track gave way and that caused a big burst of water to thrust across the pit corner of the property,” track officials said of the postponement. Dirt racing fans immediately offered to help. However, at the time, the road leading into the race track was closed off. “Thank you for all your concerns fans, but at this time Wolcott rd is now closed at the Hutton rd intersection. Please do not come out this way as the Wyandotte Sheriff is blocking the road,” the track said in a Facebook update. Lakeside Speedway is a favorite track of NASCAR star Clint Bowyer. The photo below shows the track pictured in the summer of last year. “Just the way the water rushed in was pretty devastating,” Pete Howey told Fox 4 Kansas City. The water has since begun to recede. On Tuesday, the water was down from 35 feet to 32 feet.